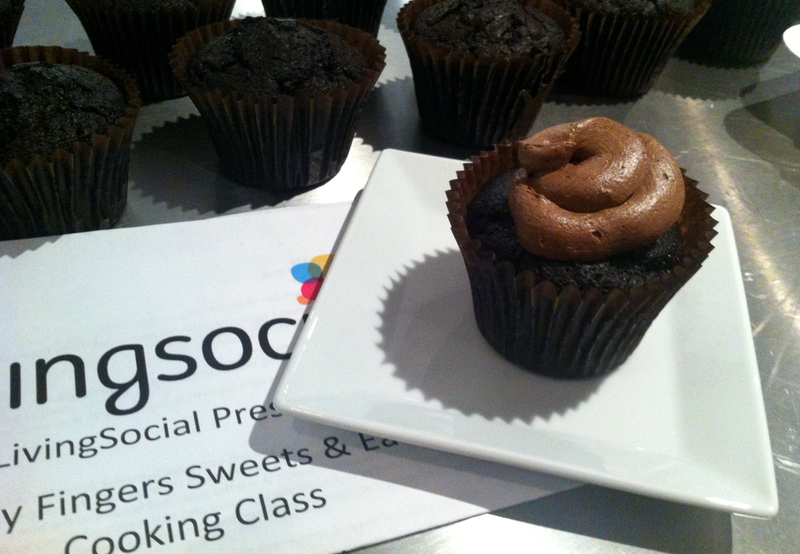 Vegan Cupcakes ~ Learn, Live, and Explore! I'm not a vegan, but I am a sucker for cupcakes. 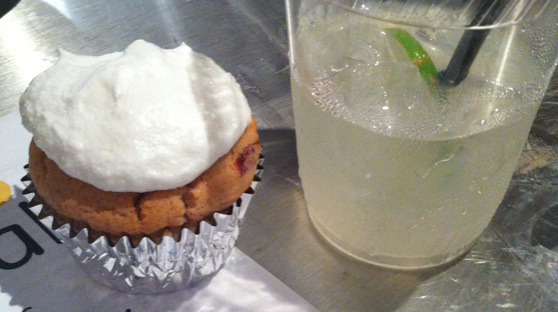 And I'm definitely a sucker for cupcakes based on cocktails. Tonight, I took another baking class from the Living Social headquarters at 918 F St. in Washington D.C. 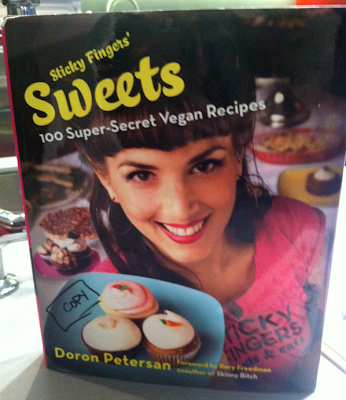 This one was taught by Doron Petersan, owner of Sticky Fingers Sweets & Eats and winner of the Food Network's Cupcake Wars and Cupcake Wars All-Stars competitions. 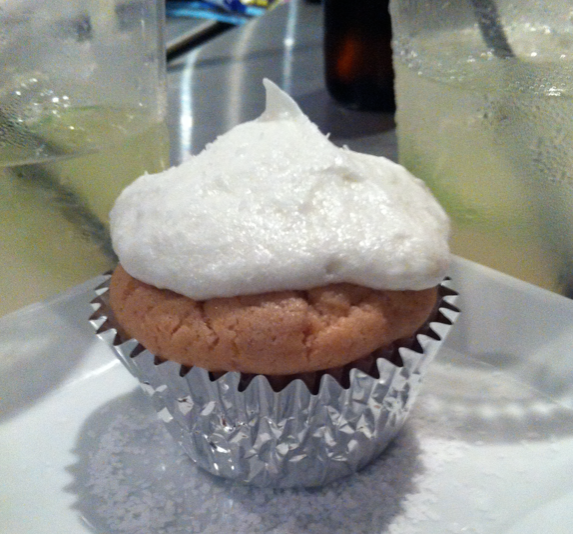 On the menu were Strawberry Margarita Cupcakes and Spicy Chocolate Cupcakes with Mexican Chocolate Frosting. 2. Sift the flour, baking powder, and salt into a medium-sized bowl. Set the bowl aside. 3. In the bowl of the stand mixer, cream the sugar and the margarine with the whisk attachment, about 5 minutes. Scrape down sides and bottom of the bowl. 4. In a small bowl or cup, combine the water and egg replacer, and whisk to dissolve the egg replacer (see bubbles). Add the egg replacer to the sugar and mix until combined. Scrape the bottom and sides of the bowl. 5. Add the strawberries and strawberry puree and mix to the sugar until well combined. Scrape the bottom of the bowl. 6. In a small bowl, combine the soymilk and vanilla, and set aside. 7. Turn the mixer speed to low and slowly add the dry ingredients and the soymilk, alternating between the two, ending with the soymilk. Before ingredients are completely mixed together, take off mixer and fold the batter in order to not overmix. 8. Fill lined cupcake tin 3/4 full and bake 16 to 19 minutes, or until toothpick inserted in the center comes out clean. 1. In a medium, heavy bottomed sauce pan, heat 1 cup strawberries (fresh or frozen, hulled) on medium-high heat, stirring constantly until they breakdown - approximately 15 minutes. 3. Return to heat and cook down until most of the liquid is evaporated, about 15 minutes. Let cool completely before using. 1. In the bowl of the stand mixer, whip shortening with the paddle attachment until completely soft. Scrape the bottom and sides of the bowl. 3. Once sugar is incorporated, add the tequila and lime juice (half at first, then the rest) and mix on low until the liquids are incorporated. 4. Scrape the bottom of the bowl and mix on medium-high speed until all ingredients are combined and the frosting is fluffy, about 2 minutes. Add sugar if not fluffy enough. 5. Add one or two drops each of yellow and green food coloring and mix until incorporated. 6. Frost cupcakes, as desired, and sprinkle lightly with salt. 2. Sift the flour, sugar, cocoa, cinnamon, baking soda, cayenne pepper, and salt into a medium-sized bowl. Set the bowl aside. 3. In a small bowl, whisk together the coconut milk, oil, coffee, and vanilla. 4. Add the wet ingredients to the dry ingredients and whisk until just incorporated. 5. Fold in the vinegar until you begin to see streaks (you will see the vinegar turn the batter light brown). Do not over mix the batter. 6. 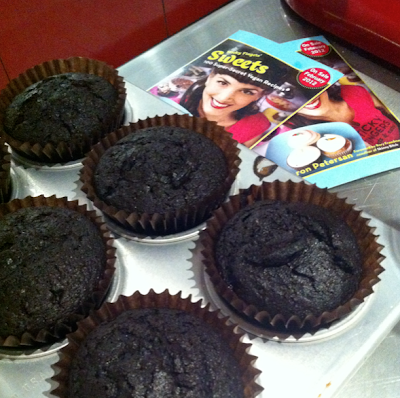 Fill lined cupcake tin 3/4 full and bake for 16-19 minutes, or until toothpick inserted into the center comes out clean. 1. In the bowl of a stand mixer, whip shortening and margarine with the paddle attachment until completely combined. Scrape the bottom of the bowl to ensure that all ingredients are mixed thoroughly. 2. In a separate bowl, sift together the powdered sugar, cocoa powder, cayenne pepper, and cinnamon. 3. On low speed, slowly add sugar mixture to the shortening mixture, a little at a time. 4. Once the sugar and cocoa are incorporated, add the vanilla and soymilk and mix on low until the liquids are incorporated as well. 5. Scrape the bottom of the bowl, and mix on medium-high speed until all ingredients are combined and frosting is fluffy, about 2 minutes.